Kimitec Caos 10.5% Liquid Calcium is a product with a high concentration of calcium that prevents and corrects the possible calcium deficiencies in all kinds of crops. Please note this product is not for sale in CA, OR, and WA. Kimitec Caos 10.5% Liquid Calcium with Lignosulphate and allowed as foliar spray in organic agriculture. Kimitec Caos is a product with a high concentration of calcium that prevents and corrects the possible calcium deficiencies in all kinds of crops. Its special formulation with lignosulphonated compounds allows improved calcium absorbtion. Allowed in organic production as a foliar spray to treat physiological disorder. The symptomatology of calcium deficiency is diverse and varies from simple foliar chlorosis to the necrosis of the fruit. In general, it affects the organs of the plant that have higher calcium demands: meristematic apices and fruit. 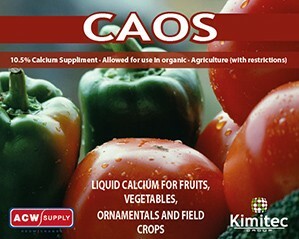 Caos is one of the highest rated Kimitec Products by our growers for use in both fruits and vegetables to eliminate blossom end rot, as well as in flower production to increase calcium without having to use a calcium nitrate product when nitrogen is not wanted or needed.